The new icing forecasts should be especially valuable for commuter planes and smaller aircraft, which are more susceptible to icing accidents because they fly at lower altitudes than commercial jets and are often not equipped with de-icing instruments. 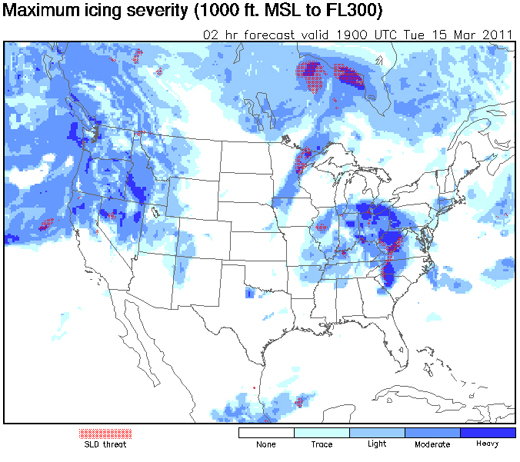 The new FIP-Severity icing forecasts are available on the NWS Aviation Weather Center’s Aviation Digital Data Service website. According to NCAR, aviation icing incidents cost the industry approximately $20 million per year, and in recent Congressional testimony, the chairman of the National Transportation Safety Board (NTSB) noted that between 1998 and 2007 there were more than 200 deaths resulting from accidents involving ice on airplanes.